Sciency Thoughts: Sinkhole swallows car in Jacksonville, Florida. 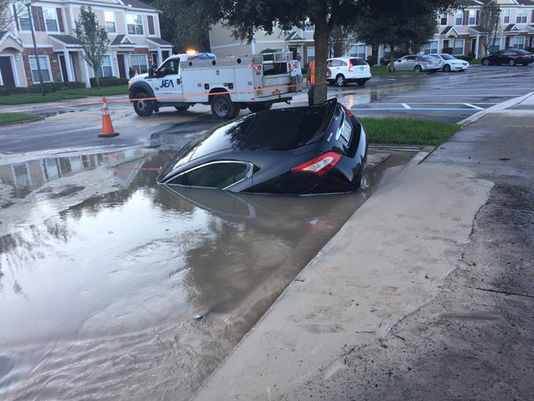 Sinkhole swallows car in Jacksonville, Florida. A parked car was swallowed by a sinkhole in the south Jacksonville community of Mandarin on the morning of Friday 20 November 2015. Nobody was injured in the incident, however nearby buildings were left without water and considerable repair work will be necessary to the road; it is unclear if the car can be salvaged. The 20 November 2015 Mandarin sinkhole. First Coast News. The approximate location of the 20 November 2015 Mandarin sinkhole. Google Maps. 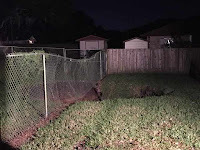 Many parts of Florida are particularly prone to sinkholes, due to the porous limestone that underlies much of the state. This is eroded over time by acid in rainwater (most rainwater is slightly acidic, though pollution can make this worse), and can collapse suddenly, causing overlying sediments to collapse into the hole and a sinkhole to open up. This can be triggered by human activity, such as pumping water out (which causes the water to flow, facilitating acid dissolution of the limestone), but is essentially a natural process. However in this occasion the sinkhole is believed to have been caused by a ruptured water main, which washed away unconsolidated sediments beneath the road, leading to the collapse. Homes destroyed by Florida sinkhole. 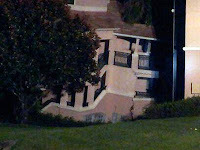 Florida holiday villa collapses into sinkhole. Woman killed by Himachal Pradesh landslide. Asteroid 2015 VE65 passes the Earth. Asteroid 2015 WP2 passes the Earth. Asteroid 2015 VV2 passes the Earth. Genotyping a 500-year-old Inca child mummy. Asteroid 2015 VD105 passes the Earth. Magnitude 4.0 Earthquake on the coast of Algeria. Asteroid 2015 VU65 passes the Earth. Flights cancelled after eruption on Mount Colima. Discovering the origins of Myxozoan parasites. Asteroid 2015 VY2 passes the Earth. Asteroid 2015 VT64 passes the Earth. Leonid Meteor Shower falls this week. Asteroid 2015 VZ2 passes the Earth. Magnitude 6.8 Earthquake in central Chile. Asteroid 2015 TD179 passes the Earth. Magnitude 1.1 Earthquake in Somerset, England. Bright fireball over Saskatchewan and Manitoba. Asteroid 2015 TR238 passes the Earth. Cyclone Chapala makes landdall in Yemen. Sinkhole devours garden in St Ives, Cornwall. Asteroid 2015 TF passes the Earth.